This is a plant for all seasons. You know that I love serrata and you know I love variegated foliage. Well, guess what, this plant is both! 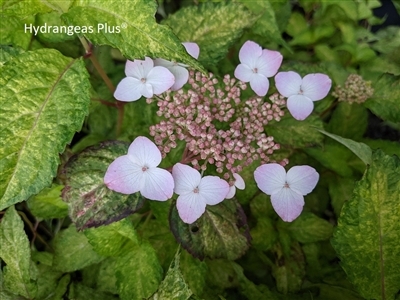 Pink veins and green, white and silver randomly speckle the leaves. True to serrata, blooms are pH sensitive starting white and then aging pink or blue depending on the soil acidity. We see blooms a little later in the spring than other serrata but come fall, blooms are bright red and just pop for late garden interest.